AIFS students studying in Limerick can choose from a wide range of courses offered by the University to international students, provided that prerequisites are met. 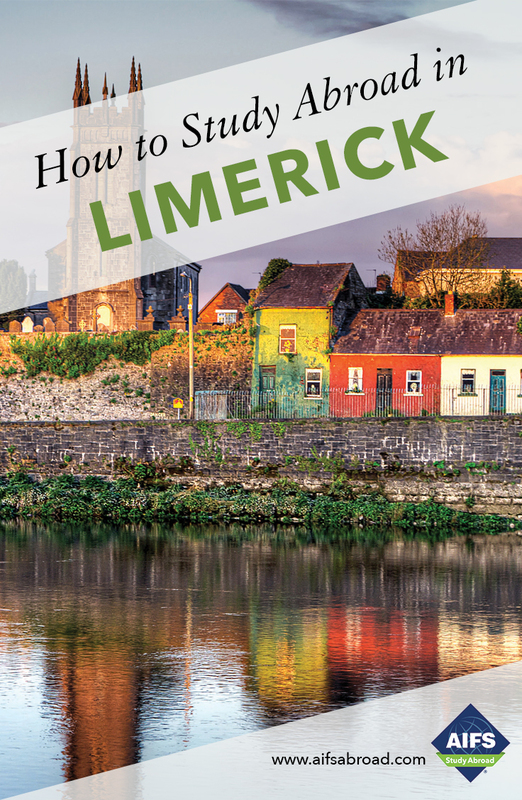 Along with other international students, you will take classes alongside University of Limerick students and become fully integrated into the student body. Although most students take Irish studies courses such as Irish language and literature, history, folklore, traditional music, politics and sociology you can also choose from a huge range of courses in any of the four colleges at the University of Limerick listed below. All courses are recommended for 3 credits each and meet for approximately 45 contact hours per semester. Taking up to 5 courses you can earn up to 15 credits in a semester. History, Irish World Academy of Music and Dance, Law, Languages, Literature, Culture and Communication, Politics and Public Administration, Psychology and Sociology. Education and Professional Studies, Physical Education and Sports Sciences. Chemical and Environmental Science, Computer Science and Information Systems, Civil Engineering and Materials Science, Design and Manufacturing Technology, Electronic and Computer Engineering, Life Sciences, Math and Statistics, Mechanical, Aeronautical and Biomedical Engineering and Physics and Energy. Accounting and Finance, Economics, Management and Marketing and Personnel and Employment Relations. A 3-credit service learning course is also available which brings together students, academic staff and community partners to focus on an area of need within the community. No AIFS participant is permitted to take a course without receiving a letter grade. Pass/fail options are not available. The University of Limerick is one of Ireland’s (and Europe’s) most prestigious public universities with 13,000 students. Its park-like campus is three miles from the city on the banks of the River Shannon. The location along with the magnificent facilities such as the Sports Arena, University Concert Hall and Irish World Academy of Music and Dance make this the ideal campus for learning and recreation. UL is home to a €31 million library, the biggest campus library in the country and one of the most digitally advanced in the world plus the longest pedestrian bridge in Europe which joins the north and south campuses. The University of Limerick was named ‘Irish University of the Year 2019’ in the Sunday Times Good University Guide. UL’s leading position in graduate employability, strong research commercialization, the €52 million Bernal Project in science and engineering, excellent results in the annual Irish Survey of Student Engagement and a rising academic performance were among the reasons for the award. The University fosters a broad arts program. It is the permanent home to several art collections along with the Irish World Academy of Music and Dance, an internationally acclaimed center for innovation and research in music and dance performance and the University Concert Hall which regularly hosts international performing artists. AIFS students can choose from an extensive list of UL courses, making it one of the best places to study if you have a major that otherwise makes it difficult for you to study abroad.